The service costs $4.99 per month or $49.99 per year, and is focused heavily on live coverage of pro baseball, hockey, and soccer, and to a lesser extent sports like basketball, boxing, auto racing, rugby, and tennis. Conspicuously missing from the equation is NFL football, though missing leagues may be added later. By default, live games will stream at 60 frames per second. Subscribers also get on-demand access to ESPN's "30 for 30" documentaries, and some exclusive shows, such as "Detail" —set to air during the NBA playoffs, and hosted by Kobe Bryant —as well as the eight-part "Draft Academy." ESPN+ is based on technology from BAMTech, which Disney acquired a 33 percent stake in for about $1 billion in August 2017. The company is prominent in the video streaming industry, some other clients being the NHL, MLB, PGA, WWE, and HBO Now. The service is being positioned as complementary to the main ESPN channels, and as such will actually lack some flagship shows, particularly "SportsCenter." Launch platforms include iOS, Apple TV, Android/Chromecast, Amazon devices, and the Web. 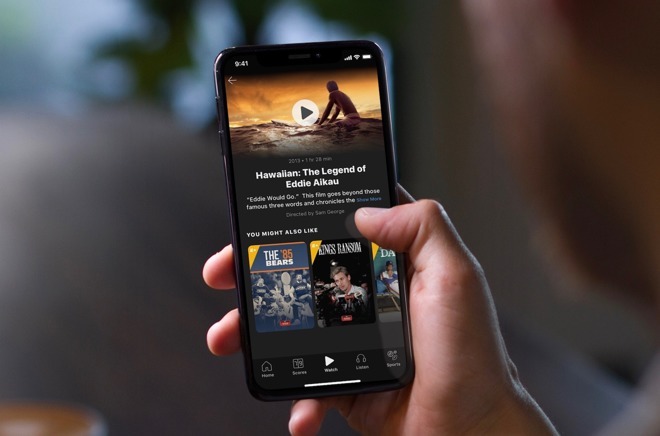 On Apple devices, ESPN+ is included as an option within the main ESPN app, which has been updated for compatibility as well as a new user interface. Disney is using it as a test-bed and foundation for its own forthcoming streaming service that will raise the ante for Apple's upcoming video efforts. Apple is expected to launch its first slate of high-budget programming as soon as March 2019, with the help of a number of high-profile industry executives led by Jamie Ehrlicht and Zach Van Amburg. Apple, though, is focusing primarily on scripted content, the most recent addition being an adaptation of Isaac Asimov's sci-fi epic "Foundation." Other sci-fi shows include an "Amazing Stories reboot and a drama from "Battlestar Galactica" veteran Ronald Moore. Other planned vehicles include a sketch show starring Kristin Wiig, and a morning talk show drama with Reese Witherspoon and Jennifer Aniston. Rapper and frequent Apple Music collaborator Drake has allegedly been granted a blank check to work on shows and movies.